Waterspecialist WS613B-3 - Waterspecialist is an independent brand. Economical: fits and functions perfectly at a substantial savings over the original. Eco-friendly: uses renewable materials to ensure our filters are healthy for our customers and the environment. Note: please note this is a compatible spare part and the manufacturers' names and part numbers have been used for reference purposes only. 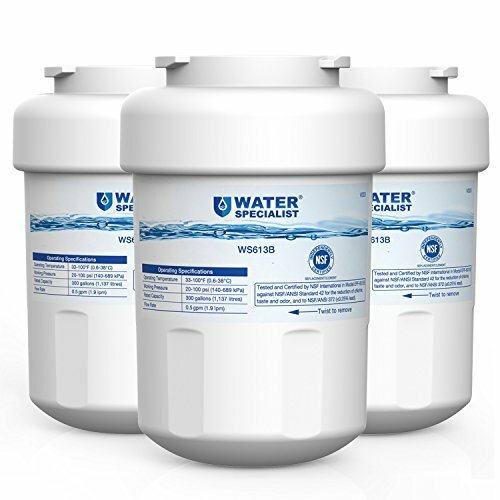 Waterspecialist ws613b replacement refrigerator Water Filter We are committed to water treatment research and try harder to provide the best products in the water filter market. Certified to nsf 372 this water filter is certified to NSF 372 for lead-free material. Compatible refrigerator models bss25jfrjww, hss25gfpjww, dss25ksrbss, pcf25pgsbww, gfss6kkyess, gss25gmhes, gss25gghbcbb, hss25gftabb, pss29nhmbbb, gsc22kgrdww, zis420nrk, ziss420dress, psk29nhwgcww, gsl25jfxnlb, pcf25pgtbbb, gsl25jfrfbs, gfss2keycss, gshs6lgbbhss, gwe23lgyafss, pfss6pkxbss, gss25gmheces, gsf25igxpbb, gss25gshbcss, hss25gfpaww, pie23ngtifkb, hsm25gfrjsa, gse25hmhes, hst22ifmcww, psc23shrcss, pss23mgtabb, gcu23lgydfss, pst26shrcss, gsh25jstass, gss25gfxjbb, pcf23ngtabb, hsm25gfrfsa, hsk29mgsaccc, pss23mgtebb, gsh25jfxjww, hss25ifmaww, gss23lgtacc, gsh22jszbss, psr26lgpebb, pce23ngtjfss, psk27nhscccc, zicp360srass, pse25kshss, pshs6pgzbess, pfss9pkyass, gsh25jfxnww, hsm25gfresa, hss25gftaww, psc23nhmdww, tfx30ppbeww, gss23wstass, hss25ifmdww, gshl5kgxgcls, tpx24bpzbww, zicp360srfss, psk25ngndccc, pss25ngmbcc, pshf6pgzbebb, gss25wstfss, hss25gfpdww, gss25wstass, zce23ngtjfnb, psp25sgmfcbs, pse29nhwhcss, psc23mgsabb, tfx25ppbecc, dss25kgrebb, psc25pssbss, gsl25igxnls, gse25hshss, hss25ifpeww, pit23sgrcsv, pfcs1nfzass, psc23mgmaww, psf26ngtcbb, pcp23shmffbs, hsm25gfrasa, gshs6hgdbcss, gshl5kgxccls, gss25tgmbww, gfss6kkycss, gshf5kgxccbb, gss25gmhbces, gsh25jsddss, gss22qfmccc, tfx30pbdaaa, gss25gshss, pfcs1rkzh, pgcs1nfzass, pshs9pgzbcss, gsl25qgpdbs, zic360nrflh, gsl25kgrebs, hss25gfphww, pss26mgpbbb, pSK25MGSBCCC, PSS26MSTDSS. 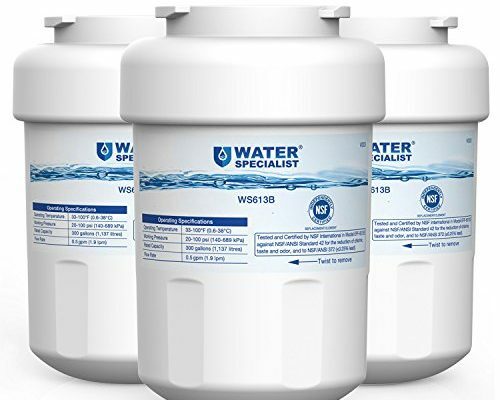 Waterspecialist Refrigerator Water Filter, Replacement for GE MWF, SmartWater, MWFP, MWFA, GWF, HDX FMG-1, WFC1201, GSE25GSHECSS, PC75009, RWF1060, 197D6321P006 Pack of 3 - Certified to nsf 42 this water filter is certified by NSF International against NSF 42 to reduce Chlorine, Taste and Odor. 100% risk-free guarantee every water filter comes with unconditional 30-day money back guarantee and a professional customer service. Waterspecialist WS613B-2 - Compatible refrigerator models bss25jfrjww, zic360nrflh, hss25gfpaww, gwe23lgyafss, gsl25igxnls, ziss420dress, gsh25jsddss, gsh22jszbss, gss25gshss, psr26lgpebb, hss25gfpdww, zicp360srass, tfx30ppbeww, gsl25jfrfbs, psk25mgsbccc, hsm25gfresa, zis420nrk, gss25gshbcss, gsf25igxpbb, pse29nhwhcss, hss25gftabb, gcu23lgydfss, hsm25gfrfsa, tfx30pbdaaa, hss25ifpeww, gss25gmhes, pshf6pgzbebb, pie23ngtifkb, pfcs1nfzass, hst22ifmcww, hsm25gfrasa, gss25tgmbww, pgcs1nfzass, hsk29mgsaccc, pfss6pkxbss, pss29nhmbbb, gfss6kkycss, tfx25ppbecc, dss25kgrebb, hss25ifmaww, gss25wstfss, pcp23shmffbs, psc23nhmdww, gsl25qgpdbs, psk29nhwgcww, hss25gftaww, psf26ngtcbb, gss23wstass, psc23shrcss, pshs6pgzbess, pss25ngmbcc, gsl25kgrebs, hss25gfpjww, hss25gfphww, pce23ngtjfss, gfss6kkyess, gshs6lgbbhss, psc23mgmaww, pshs9pgzbcss, pcf25pgsbww, gshl5kgxgcls, gshl5kgxccls, pit23sgrcsv, gss25gmheces, psc25pssbss, gse25hmhes, gss22qfmccc, pst26shrcss, gfss2keycss, gss25gfxjbb, gshf5kgxccbb, pss23mgtabb, pcf23ngtabb, pfcs1rkzh, pse25kshss, psp25sgmfcbs, gss25gmhbces, pcf25pgtbbb, hsm25gfrjsa, gsh25jfxjww, gss25gghbcbb, psk27nhscccc, pss23mgtebb, psc23mgsabb, gshs6hgdbcss, gse25hshss, gsl25jfxnlb, gsc22kgrdww, gss23lgtacc, gss25wstass, zce23ngtjfnb, psk25ngndccc, pss26mgpbbb, zicp360srfss, hss25ifmdww, dss25ksrbss, tpx24bpzbww, gsh25jstass, gsh25jfxnww, PFSS9PKYASS, PSS26MSTDSS. Nsf 42 certified: certified to deliver fresh water and ice cubes by filtering out chlorine, taste and odor. Nsf 372 certified: certified for lead-free material, preventing any health hazard to your body. Quality performance: retains beneficial minerals while removing impurities in water, serving you a superior grade of filtered water. Waterspecialist Refrigerator Water Filter, Replacement for GE MWF, SmartWater, MWFP, MWFA, GWF, HDX FMG-1, WFC1201, GSE25GSHECSS, PC75009, RWF1060, 197D6321P006 Pack of 2 - 100% moneyback guarantee: we offer 30 days return and 90 days replace at no charge after the date of original purchase for risk-free purchase. Professional service: Our professional and timely customer service stands by for your any questions. Filter life: replace your filter every 6 months or 300 gallons to achieve optimum performance. Bagean JX81H - Ge jx81h, wb02x10956, microwave recirculating charcoal Filter Nsf 42 certified: certified to deliver fresh water and ice cubes by filtering out chlorine, taste and odor. Nsf 372 certified: certified for lead-free material, preventing any health hazard to your body. Quality performance: retains beneficial minerals while removing impurities in water, serving you a superior grade of filtered water. 100% moneyback guarantee: we offer 30 days return and 90 days replace at no charge after the date of original purchase for risk-free purchase. Professional service: Our professional and timely customer service stands by for your any questions. Filter life: replace your filter every 6 months or 300 gallons to achieve optimum performance. Replacement models: ge mwf, mwfp, 197d6321p006, rwf1060, onepurify rfc2500a, pc75009, 469991, gwf01, crystala filters cf8, mwfint, gwfa, smartwater, mwfa, mist cwmf031, icepure, pure line pl-100, gwf, 469996, 46 9996, mwfap, hwf, best bf-g01, 46-9991, waterfall filter wfc1201, 46-9996, hwfa, wfc1201, gwf06, kenmore 9991, ecobluelife ebl7771, gse25gshecss, golden icepure rwf0600a, Tier1 RWF1060, pureza pf8, 46 9991, hdx fmg-1, 9996, WaterSentinel WSG-1. Bagean Microwave Charcoal Filter Compatible with GE JX81H, WB02X10956 2-Pack - Waterspecialist is an independent brand. Economical: fits and functions perfectly at a substantial savings over the original. Eco-friendly: uses renewable materials to ensure our filters are healthy for our customers and the environment. Note: please note this is a compatible spare part and the manufacturers' names and part numbers have been used for reference purposes only. Ge jx81h, wb02x10956, microwave Recirculating Charcoal Filter. General Electric WR17X11655 - Refrigerator-replacement-parts. Waterspecialist is an independent brand. Economical: fits and functions perfectly at a substantial savings over the original. Eco-friendly: uses renewable materials to ensure our filters are healthy for our customers and the environment. Note: please note this is a compatible spare part and the manufacturers' names and part numbers have been used for reference purposes only. Ge jx81h, wb02x10956, microwave Recirculating Charcoal Filter. This is a genuine replacement part. This is a genuine replacement part, the model number and Name for The Following Item: General Electric GENF0 WR17X11655 Refrigerator Drip Tray. General electric GENF0 Nsf 42 certified: certified to deliver fresh water and ice cubes by filtering out chlorine, taste and odor. GE Refrigerator Drip Tray Black - Nsf 372 certified: certified for lead-free material, preventing any health hazard to your body. Quality performance: retains beneficial minerals while removing impurities in water, serving you a superior grade of filtered water. 100% moneyback guarantee: we offer 30 days return and 90 days replace at no charge after the date of original purchase for risk-free purchase. Professional service: Our professional and timely customer service stands by for your any questions. Filter life: replace your filter every 6 months or 300 gallons to achieve optimum performance. Filterlogic FL-RF13-3 - Filterlogic fl-rf13 replacement refrigerator water filter where Healthy Water Begins NSF 42 Certified Performance Certified to NSF 42 for the reduction of Chlorine, Taste and Odor. This filter is not the original product. Save big without compromising quality. Accurate design makes the replacement a breeze. Waterspecialist is an independent brand. Economical: fits and functions perfectly at a substantial savings over the original. Eco-friendly: uses renewable materials to ensure our filters are healthy for our customers and the environment. Note: please note this is a compatible spare part and the manufacturers' names and part numbers have been used for reference purposes only. FilterLogic Refrigerator Water Filter, Replacement for GE MWF, SmartWater, MWFP, MWFA, GWF, HDX FMG-1, WFC1201, GSE25GSHECSS, PC75009, RWF1060, 197D6321P006, Pack of 3 - Ge jx81h, wb02x10956, microwave Recirculating Charcoal Filter. Compatible refrigerator models bss25jfrjww, hst22ifmcww, hss25gfpdww, hss25gftaww, pshs6pgzbess, hss25ifpeww, pfcs1nfzass, tfx30ppbeww, gshs6lgbbhss, gsh25jfxjww, gwe23lgyafss, gcu23lgydfss, zfsb25dtbss, zce23ngtjfnb, dss25kgrebb, gshl5kgxgcls, gsh22jszbss, psc23mgsabb, tfx30pbdaaa, hss25ifmaww, pgcs1nfzass, gsh25jstass, pss26sgpass, pce23ngtjfss, pfcs1rkzh, hsm25gfrjsa, hss25gfpaww, psk25mgsbccc, gse25hshss, pse29nhwhcss, pss26mgpbbb, pshf6pgzbebb, dss25ksrbss, zic360nrflh, gss25gmhbces, gss25tgmbww, pss23mgtebb, pss23mgtabb, gss25gshss, gfss6kkycss, psc23shrcss, hss25gfpjww, hsm25gfresa, psc25pssbss, pshs9pgzbcss, gss25wstfss, pss25ngmbcc, pss29nhmbbb, gss25gfxjbb, pss26mstdss, gsc22kgrdww, pie23ngtifkb, gss23wstass, tfx25ppbecc, tpx24bpzbww, zicp360srfss, gsf25igxpbb, gss25gshbcss, gse25hmhes, hss25ifmdww, gss25gghbcbb, psk25ngndccc, gshs6hgdbcss, gfss6kkyess, gss25wstass, gfss2keycss, pfss6pkxbss, gss23lgtacc, zicp360srass, pfss9pkyass, psp25sgmfcbs, gss22qfmccc, gsl25kgrebs, gss25gmhes, psr26lgpebb, gshf5kgxccbb, psc23mgmaww, pcf25pgsbww, pcf25pgtbbb, pse25kshss, hsk29mgsaccc, hss25gfphww, hsm25gfrfsa, wr02x11705, gss25gmheces, gsl25qgpdbs, pst26shrcss, ziss420dress, pzs23ksebfss, gsh25jfxnww, gsl25igxnls, gsh25jsddss, zis420nrk, pcp23shmffbs, psk27nhscccc, pcf23ngtabb, psf26ngtcbb, gsl25jfxnlb, gshl5kgxccls, pit23sgrcsv, gsl25jfrfbs, hsm25gfrasa, psc23nhmdww, psk29nhwgcww, HSS25GFTABB, ZIS420NXB. This is a genuine replacement part. Certified to nsf 372 for lead-free material, giving you the basic protection. GE MWF - Waterspecialist is an independent brand. Economical: fits and functions perfectly at a substantial savings over the original. Eco-friendly: uses renewable materials to ensure our filters are healthy for our customers and the environment. Note: please note this is a compatible spare part and the manufacturers' names and part numbers have been used for reference purposes only. Ge jx81h, wb02x10956, microwave Recirculating Charcoal Filter. Ge guaranteed fit: Compatible with select GE side-by-side and bottom-freezer refrigerators. This filter is not the original product. Save big without compromising quality. Refrigerator-replacement-parts. Newly tested and verified to filter 5 trace pharmaceuticals including ibuprofen, progesterone, atenolol, trimethoprim, and fluoxetine* * The contaminants or other substances removed or reduced by this water filter are not necessarily in all users’ water"Product description: "What's in the BoxOne GE MWF replacement refrigerator water filter. General Electric MWF Refrigerator Water Filter - Replaces gwf, gwf01, gwf06, gwfa, MWFA. Premium filtration: certified to reduce chlorine-resistant cysts, lead, select pharmaceuticals and 15 other contaminants. General electric GENF0100% satisfaction guarantee with the top-quality product, prompt service and timely delivery. POMODORO COMINHKPR136940 - Replaces gwf, gwfa, gwf01, gwf06, MWFA. Aluminum head with foldable wooden handle, measuring 12-inch wide by 14-inch long with a 10-inch foldable handle. This filter is not the original product. Save big without compromising quality. This is a genuine replacement part. Total length when fully extended is 24-inch long. Ge's most advanced filtration Tested and verified to filter five trace pharmaceuticals, including ibuprofen, progesterone and others. Perfect as a cake lifter. Foldable design for extremely easy storage, restaurant, capable to fit in any kitchen size; in a house, apartment or condo!. With a safety backstep, this peel is designed perfectly for lifting pizzas, or cake sheets out of the oven, pizzeria pronto, the Metal Pizza Paddle is a must have for any baker and pizza chef. Chef Pomodoro Aluminum Metal Pizza Peel with Foldable Wood Handle for Easy Storage 12-Inch x 14-Inch, Gourmet Luxury Pizza Paddle for Baking Homemade Pizza Bread - Works exactly like the original filter without water leaks. Premium filtration: certified to reduce chlorine-resistant cysts, lead, select pharmaceuticals and 15 other contaminants. The paddle is a perfect match for any kitchen décor, gourmet pizza parlor and bakery. Not dishwasher safe Once you are finished cleaning, loosen the wood knob and turn handle inward for storage. Certified to nsf 372 for lead-free material, giving you the basic protection. Scrap off any excess food or crumbs from the peel using a soft sponge. Heritage Acacia Wood Pizza Peel, Great for Homemade Pizza, Cheese and Charcuterie Boards - 22" x 14"
International Playthings T7028A1 - Accurate design makes the replacement a breeze. Please note this is a compatible spare part and the manufacturers' names and part numbers have been used for reference purposes only. Compatible with uuni 3, Green Egg, most commercial pizza ovens and accessories, Mastercraft!. Beware of imposters! only tomy makes the authentic version of this fun family game that is truly a barrel of laughs. Pop Up Pirate - 5. This is a genuine replacement part. Ge's most advanced filtration Tested and verified to filter five trace pharmaceuticals, including ibuprofen, progesterone and others. Works exactly like the original filter without water leaks. Total length when fully extended is 24-inch long. The surprise family game that is a real barrel of fun. Family fun for ages 4 and up - this simple game can be played by up to four at a time and doesn't require complicated cards or rules, making it a great choice for the whole family. YUNDA RWF0600A-3PACK - Retains beneficial minerals to produce healthy drinking water. Highest filtration lifedouble capacity. Lasts for up to 1500 gallons or 6 months. Natural coconut shell Activated carbon ensure contaminant reduction. Remove sediment, particles, color, rust, Chlorine, Voc, Odor, THM'S. Compatible modelplease note that this is a compatible spare part, gwfa, mwfint, mwfp, mwfap, the manufacturer`s names, gwf, part numbers have Been Used For Compatibility Information ONLY. Compatible with mwf, gwf01, mwfa, gwf06, hwfa, HWF, FMG-1. Easy installation and Operation No tools required. Rwf0600a compatible withkenmore-----46-9991, wsa-1 brita-------gerf-100【important】★please be aware that this is a compatible spare part, hwf, gwf01, hwfa, 46 9996, gwf, mwfa, fmg-1, gwf06, gwfa, 46 9991, mwfp, 9996 ge------mwf, 9991, mwfint, 46-9996, the manufacturer`s names, mwfap, 469996, 469991, homedepot----fmg-1 aqua fresh---- wf287 swiFT GREEN----SGF-G1 WATER SENTINEL----WSG-1, Part Numbers Have Been Used For Compatibility Information ONLY. IcePure MWF Refrigerator Water Filter Replacement GE MWF,MWFP,MWFA,MWFAP,MWFINT,GWF,GWF01,GWF06,GWFA,HWF,HWFA,FMG-1,RWF0600A 3PACK - For detailed setup guideline, please refer to the installation instruction in the box. This filter is not the original product. Save big without compromising quality. Easy set up with no batteries required - Pop Up Pirate features easy set up and is powered by you and a clever spring, so the fun starts whenever you're ready! Please note this is a compatible spare part and the manufacturers' names and part numbers have been used for reference purposes only. Range Kleen WKT 4162 - Compact design: Packs a lot of battery organization into a unique, durable design. Nsf certifiedicepure brand filters was tested and certified by NSF International against NSF/ANSI Standard 42 for material and structural integrity requirements. Wqa certified icepure brand filters was also tested and certified by wqa to nsf/ansi42 for material satety and structural integrity only. The range kleen wkt4162 82-battery organizer is the battery caddy that goes anywhere, including on the wall with the included mounting hardware!•BEATS YOUR AVERAGE AA BATTERY ORGANIZER ANY DAY. Total length when fully extended is 24-inch long. Ge's most advanced filtration Tested and verified to filter five trace pharmaceuticals, including ibuprofen, progesterone and others. Battery Organizer Storage Case by Range Kleen Holds 82 Batteries Various Sizes WKT4162 Removable Battery Tester - Family fun for ages 4 and up - this simple game can be played by up to four at a time and doesn't require complicated cards or rules, making it a great choice for the whole family. Perfect as a cake lifter. Foldable design for extremely easy storage, restaurant, capable to fit in any kitchen size; in a house, apartment or condo!. With a safety backstep, pizzeria pronto, this peel is designed perfectly for lifting pizzas, or cake sheets out of the oven, the Metal Pizza Paddle is a must have for any baker and pizza chef. Twist and lock design: simple design provides easy, tool-free, no-mess filter replacement. Max.